You’ve heard about elearning. Perhaps you’ve even considered pursuing online training as an option for your business. Yet each time you bring up elearning to a colleague or your boss, they respond with “It won’t fit with our current training program”, “It’s too expensive” or “Who wants to watch boring PowerPoints?”. These elearning myths are holding your company, and consequently your employees, back from valuable training opportunities. Significant advances in eLearning technology over the past few years not only have made building courses simple and cost-effective, but also resulted in an increase of quality off-the-shelf online training courses available for purchase. Our free ebook, ‘5 eLearning Myths and How to Avoid Them‘, debunks the five most common elearning myths from “eLearning is boring” to the perceived expense and time-commitment involved with creating courses. Each chapter covers the reality of each elearning myth, as well as shares tips on how to avoid your company falling victim to these myths. 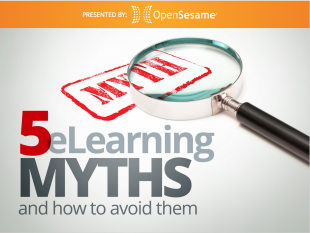 Download your free copy of ‘5 eLearning Myths and How to Avoid Them” and start building an engaging, cost-effective elearning program for your company.